Exploration of the Robin Hood Theme. Due to the large distances that needed to be traversed in the while carrying out harvesting and land management activities, I decided I needed some sort of machine to move about. 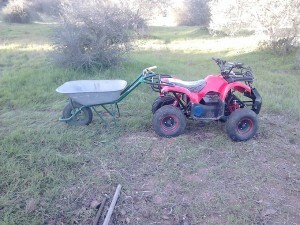 Having to haul a loaded wheelbarrow an average distance of 2 km is not really my idea of fun. I wanted an electric vehicle that would be in keeping my overall renewable energy strategy. I began searching for electric quad bikes. 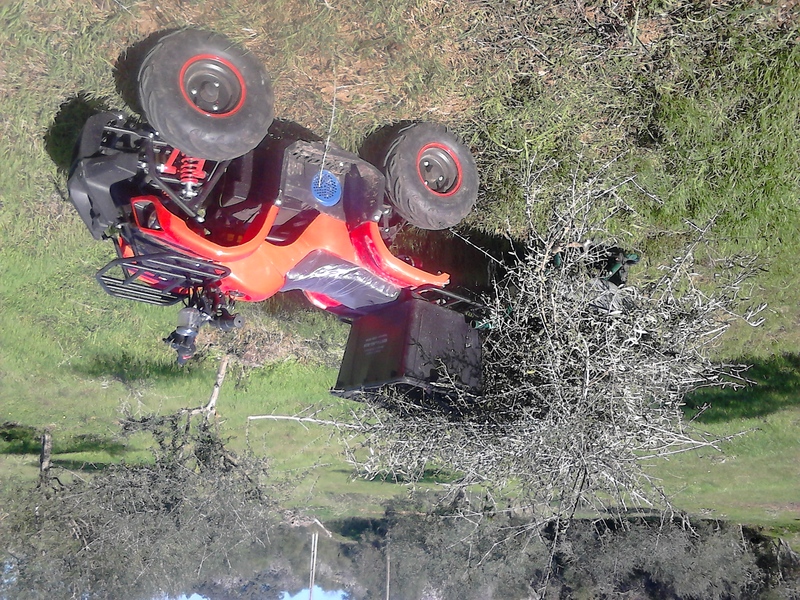 Initially all I could find were quad bikes only suitable for children and very expensive adult size quad bikes available and assembled in Europe. Once again the Chinese came to the rescue with a solution. For the past three years I’ve been very pleased with the Chinese designs and built direct drive electric scooter. I now found a model of quad bike that seemed to be both affordable and capable. I ordered it through a Portuguese company based in the north of Portugal. Now that I know the model, I know I could have saved over 100 euros if I had imported directly via a distributor based in Germany. However I am happy with the technical support I have received from the Portuguese company to date. The bike arrived partly assembled. I had to put on the wheels and the handle bar and not much else. The bike is adequately suitable for a medium sized adult and can carry a maximum weight of 120 kilograms. It has a two speed controller and a reverse mode which is very useful for getting out of trouble. I find that the 1000 Watt motor to be sufficiently powerful for what’s needed. It runs on a voltage of 48 Volts. If you open the throttle fully from a stationary position it will rear up and do a ‘wheelie’ I won’t be doing these intentionally as it is an unnecessary risk. This model is a chain rear wheel drive. The bigger front tyres do make a difference in clambering over obstacles. The bike is not road legal and can only be used on private property. This does not affect me too much as I was banned from driving years ago. I have a bridle path I can go up and down and have created a corridor through a couple of Portuguese neighbours’ properties. It has a rated maximum speed of 25 km an hour and a range of about 20 kilometres on full charge. It is not recommended for use in wet conditions as the electrics have not been protected in waterproof housings. Fortunately we don’t have many rainy days here in the Algarve, Portugal. 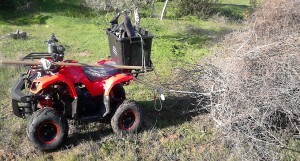 It’s early days yet but almost a month of usage, I have to say I am really impressed with the quad bike. I was intially going to buy a trailer. Besides the expense I think what’s available is inadequate. I have found a wheel barrow attached with a couple of elasticized luggage straps are adequate for my needs. 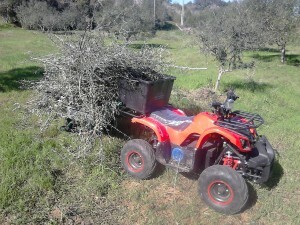 This allow the the wheelbarrow sufficient diagonal play required during turning, I am going to modify the wheel barrow by cutting down the stands for additional ground clearance and fitting on some sort of extension to carry larger volumes of brush wood. I haven’t used it for recreation at all but I will keep you posted . This entry was posted on Sunday, February 4th, 2018 and is filed under Sustainable Living. You can follow any responses to this entry through RSS 2.0. Responses are currently closed, but you can trackback from your own site.